In the previous issue we dealt with the fact that bolts can withstand significantly less cyclic loading than steady loading. We are now looking at the mechanics of why bolts fail if flanges are allowed to separate during operation. A flat faced flange connection is shown in section in Drawing I. It is somewhat exaggerated to more clearly illustrate the principle. This is the kind of connection that would be used in a cyclic loaded strut member. The same type joint is typically used when a compressor or power cylinder is mounted to the crankcase of large stationary equipment. 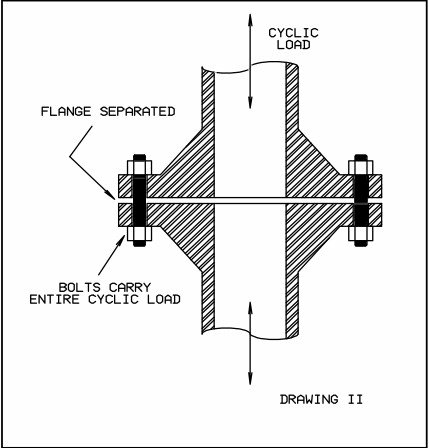 As long as the flange surfaces are held tightly together, the cyclic stress sees the assembly as one solid piece. The cyclic component is thus distributed over the entire area, so that the bolts see only the proportion of the total stress that their cross sectional area represents, ie., only about four percent* for the design flange shown. The bolts are, thus, in what is known as a protected condition. *This difference is less for other, more complex, flange designs. The protected condition depends upon the pretension (steady load) on the bolts being sufficiently high to hold the flange tightly together under the cyclic loading. 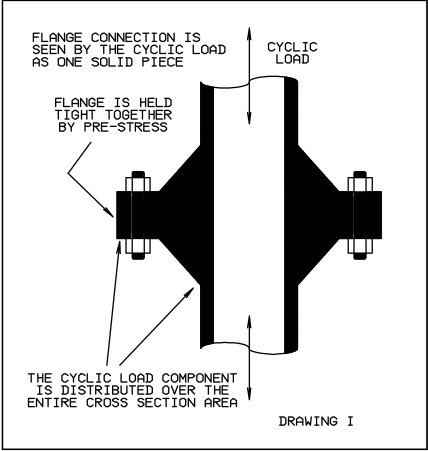 Should the pretension be too low, the flange faces will separate during at least part of the loading cycle, as shown in Drawing II. Under this condition, the full cyclic load must be born by the bolts (100 percent). Because of the bolts lessor ability to withstand cyclic loading than steady loading, they have thus become subject to cyclic over stress and probable fatigue failure. In the next issue, some tricks to lessen the bolt’s susceptibility to flange separation will be looked at. Continue to the next article in this series.